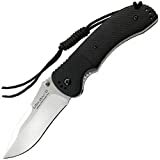 If you’re looking for a good but inexpensive EDC folding knife, something very solid and beefy, for under $25, check out the Ontario Utilitac II by Joe Pardue. Especially if you’re looking at the ever popular Zero Tolerance 0350, but a $130 folder isn’t quite in your budget, the Utilitac II is well worth considering. PLUS while the ZT 0350 reviews love it off the charts, the “6 months later” reviews often conclude “sold it, too damn hard to sharpen that beautiful recurve blade”. (sharpening a recurved blade may not be a big issue, especially with a Spyderco SharpMaker, but that’s a different story for another day). The Utilitac II comes in 2 blade options: a drop point blade, and a reinforced tip American tanto. Both are quite popular, so the blade shape really comes down to your anticipated use. The Tanto is great for penetration, while the drop point will of course slice better for everyday tasks. The handle comes in 2 options as well: both Zytel, but one is rounded and one is textured and square-ish. Overall, this is not a bad knife for the price. Very solid blade, very smooth action, and fast open. Blade is 3.25″, and at 5.4oz it’s very solid. What’s incredible, it was $25 delivered from Amazon. Here are the other configurations as well. Tip: keeping in mind this is a lower cost knife, I’d stay away from the black coated blades… besides, their satin blades look far better in my opinion. If you’re looking for a good, solid folding knife for $25, you’d definitely want to check out the Ontario Utilitac II. Personally, I would save up a few more dollars and upgrade to one of the Spyderco value line folders… such as the comparably sized Spyderco Tenacious, or the larger bladed Spyderco Resilience. Both are excellent knives, running around $40 delivered. To me, considering Spyderco quality, the $15 difference for the Spyderco is very much worth it. Hold one of each in your hand and you’ll see what I mean. 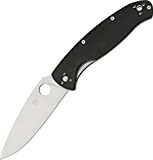 If money is not really a concern and you can go to the next level price wise, I’d take a step back and check out one of Spyderco’s higher end knifes, such as the most excellent Spyderco Military. For a closer look, here are some videos reviews.